In this occasional series we look at what the future of business media might look like. We have begun by thinking about magazines and the implication of the web for the delivery of news. Now we turn to the second half of the magazine where we still offer the same mix of tired features we always did. In the new world we will be doing this with less staff resources and less budgets for contributors. Editors are faced with two options. Either stick with the old features plan and produce it on the cheap (probably with a renewed focus on ad get features) or come up with a new model. The problem with the first option is that it will accelerate the demise of the title - and its likely that the content will be driven by dull ad get features that won't get many ads. Editors have to plan for writing their magazines with less resource. That means tapping into industry experts for content, not freelance journalists. It means thinking about articles which coach, challenge, analyse and predict, rather than articles which report, collate and sell. Is any of this possible. With magazines closing all around us, publishing companies in trouble it is liekly that the real truth is that the future of b2b writing is web only. Magazines are irrelevant to that and are probably distraction from solving the web dilemma. Paul Conley argues here that the future is bright for b2b journalism, its just got nothing to do with print magazines. The challenge, which we come on to next, is how to do that and make money too. An annonymous comment posted to this blog claims that cuts at Incisive Media are deeper than first thought. Many more than 50 jobs are going he/she claims, with deep cuts in editorial. If cuts are to be made, cut deep and cut early would be my advice. It is also plain that the downturn is getting worse and getting worse quickly. Incisive are very exposed to the financial sector so they are bound to be hurting. Even businessses with large events will start to feel the pain soon. As this review of Paid Contents recent conference points out, not only are marketing budgets likely to be cut, but attendees will be under increasing pressure not to travel. 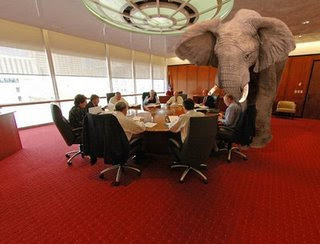 The article makes some important points that leaders in B2B will have to address, what the author calls, the elephants in the room. I agree. Here is my summary of them and some of my own. If we have been propping up the profits of failing magazines with events and awards during the good times, what will happen to the business when events and awards get squeezed in a recession? If the future is digital, how can we build businesses that have enough scale to replace revenues lost in the magazine decline? If we can't build digital businesses of scale, how are we going to afford the levels of overhead we have in our businesses? If online advertising is not sizeable enough what makes us think we can build our businesses with subs revenue? Isn't this hope over experience? Why do we keep applying the old revenue models to the new digital paradigm? What is the new model? If you want to keep an eye on whats being discussed, Rex Hammock is blogging the conference here. Apologies for the light posting, but the real world has rather got in the way of doing this. This is looking like a perfect storm. As an example, The Telegraph reports what you already know. The sale of RBI is in trouble. The staple finance is rumoured to have unravelled a bit with at least one bank pulling out, the price is falling as trading gets worse by the day and the owners, Reed Elsevier will have to provide debt and probably leave some skin in the game to get the deal done at all. "Nielsen Business Media is transforming our organization to better position ourselves to compete in a global, digital economy. Looking at the continually changing business landscape and current economic climate, and considering the requirements we've established for ourselves, it's clear we have to be as efficient as possible. As part of our ongoing efforts to streamline our business, we made the decision to eliminate some positions within the company. The resulting cost efficiencies will allow us to reinvest savings in other parts of the business, such as improved technology and software, that will further drive growth." As they say in chat rooms, LOL. Incisive Medias Softworld show suffered from low attendance a source tells me. This is interesting as it is one of the first big shows to take place after the chaos for the last few weeks economic news. The event took place this week at Olympia 2. There might be local reasons for a problem but we might wonder if attendance at trade shows is less of a priority for b2b buyers in a downturn. If that is true, the safe haven of exhibitions (UBM?) could be a more dangerous place than its advocates believe. The long wait for news on the sale of RBI is sapping morale of staff and managers according to insiders. Reed Elsevier CEO has sent recent email that confirms an announcement is expected imminently but the staff are less optimistic and fear that the credit crunch will delay a deal until after Christmas. Meanwhile I undersand that regional offices of star product, Totaljobs have been closed down just 18 months after they were opened. The downturn has bitten traditional recruitment hard and it seems that job boards are not going to be immune. Emily Bell says what is is happening in media is systematic meltdown. She is head of digital content for the Guardian. She doesn't mention business press, but does say that its all over for radio, national newspapers, UK owned TV (except for the BBC) and the the regional press. The only reason she doesn't mention business to business, is that she forgets about it. We have bitched before that no one writes about this sector in the mainstream media press or the trade media press, despite its importance to the media economy. The Media and Money Conference in New York is a talking shop for the great and the good of media. A panel there says that for media, the worst is yet to come. There is always a lag between the start of a downturn and the impact on media spend, so expect 2009 to be rough as you you prepare budgets for next year. Of course, the panel members reprted in Ad Age said it would be fine in their own businesses which were well placed to do well notwithstanding. Funny that. Everybody thinks its going to be the other guy that suffers. You know and I know that it's all of us. Well, its all a little odd. The Grocer has published its ABC this week and it shows that compared to last year, the non controlled frees have gone, only to be replaced by discounted single copy sales. We don't know what the discount was or where the copies were sold so as ever with matters ABC, when it comes to B2B, the certificates pose more questions than they answer. Once all the adjustments are stripped away the profit left to be distributed to shareholders has dropped from 12.3m to 9.7m or put another way, a 21% drop. The managements preferred measure of profit (adjusted PBT) is slightly up. Bean counters will argue about this kind of thing but lets stick to the facts. From the charts in their presentation we can see that revenues were around £74m in 2001. Doing nothing but increasing prices by inflation at 4% a year should mean revenue in 2008 of 97m. It isn't. Its less than that. So the mangagment have bought and sold and launched and closed, but in real terms cut the revenue. Profits over the same period are slightly higher than inflation, but only just, and not after exceptional costs have been removed. Cash on the balance sheet has fallen this year by more than 25%. The City understands all this and in part this expains the poor share price performance. Its not all because of the crunch. It won't get any better for Centaur shareholders any time soon without some visionary actions and a robust cost cutting agenda. We have noted this before in other results presentations. The replacement of believable strategy with spin. Nobody believes that stuff in a downturn. At least you and I don't. Lots to catch up in the last few days, not least the effect of the crunch on the RBI deal. Bloomberg reports that the price continues to fall and that it is by no mean certain that any debt for the deal will get funded. If the sale goes through there will be blood on the walls as a new owner slashes through the costs. If the deal does not go through there will be blood on the walls as Reed Elsevier slashes through the costs. Reed really want to get the deal done. Whatever the value of RBI today, they will judge it is unlikely to be higher anytime soon. So can the magazine model be reinvented? Is there any future other han squezzing the last drop of cash from magazines as they die from news disintermediation by the Internet, the collapse of recruitment advertising and paid sales, and the slow but crushing decline of display advertising. Lets start with news. It's a commodity right? No one is going to pay for news unless it is bespoked for them - and even that is not without doubt. Also, news has to be up to the minute. The clue is in the word "new". With news available 24/7 and even the worst of the business media websites posting several times a day, what could you publish in a mag that was genuinely new. Today most editors are doing what they always did. The result is that by the time the article is printed and on the desk of the reader, it isn't news, its olds. News must be information not previously known to the reader. How can this be done in print in a digital world? The answer is simple. The news editor has to move the story on. If a news event has happened and already been reported on the web, even if it has been reported in a website not owned by the magazine, the news editors task is not to repeat the story, but to move it on. How might this be strucured in a news report in a our new magzine? The standfirst might usefully be a summary of the story so far, ("It has been reported that.....) but the body of the copy must move the story on. An interview with people in or affected by the story. An analysis of the implications of the story for the industry. A back analysis of how the story came about. A summary of what has been said about the story in other media or on industry blogs. You can think of more ideas I am sure. The challenge for the news desk is that this involves work. Reading stuff, calling people, making notes, thinking. It won't be good enought to re write the press release sent by the publicity department. All this means fewer stories, because each one will require more work. I can just about imagine that it would be useful to publish a round up of what has happened this week, possibly in the style of "The Week", but other wise news editors of a post digital revolution business magazine should erase the word "nib" from their vocabulary. In the next piece we will look at what might fill the rest of the pages. Meanwhile you can read parts 1 and 2 here and here. The Guardian reports that Incisive Media is cutting 50 jobs. No surprise really given their exposure to the finance sector and print advertising. Hardly news worthy either. Also misleading. The Guardian says this represents 6% of the workforce. It doesn't. Incisive does not employ 800 people. It employs more like 2000 (in the original post I said 4000- thanks to one of our readers for the correction). I think the truth is, 50 jobs in the UK are being cut. The actual number of redundancies given the vacancy provision is probably a handful. Having said that there are probably cuts being snipped in their US business too.